SolaRay infrared heating panels produce heat that is similar to the heat produced by the sun. Even on a cold day, when the sun’s invisible infrared heating rays touch your skin or your clothing, you instantly feel the warmth. SolaRay infrared heating panels work the same way, generating invisible infrared heat that gently and comfortably warms you. Have you ever been outside in the sunshine feeling the warmth of the sun, when suddenly a cloud covers the sun momentarily and you instantly feel colder? Of course the outside air temperature hasn’t changed, but the infrared radiant heat from the sun has been blocked by the clouds. Even if it is 70 degrees outside, when the sun is blocked you feel colder. SolaRay infrared radiant heating panels heat objects and surfaces in the room, turning the whole space into a radiant heater and keeping you comfortably warm. Unlike typical central forced air heaters or baseboard and wall heaters which utilize convection, SolaRay panels utilize infrared heating to warm you just like the sun does when you are outdoors. 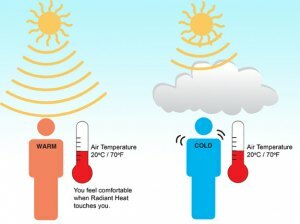 It is incredibly wasteful heating a room, just so the air gets warm enough for your to feel warm. With infrared radiant heaters, you don’t need to heat up the air. Instead our radiant heating panels directly heat people, furniture, walls, and floors in a room with a comfortable heat that gently increases the ambient temperature of the room. 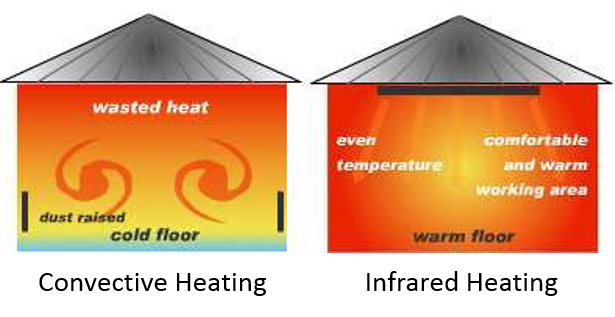 This method of heating is more pleasant when compared to heating systems that rely on convective air currents to circulate warm air in a room. Infrared is radiation that is beyond the visible spectrum. Far IR is what Ducoterra infrared radiant panel produces (peak is around 8um) We use Far IR for heating people because it is readily absorbed by water molecules (of which you’re a mostly made of!) – this results in the heat quickly transferring to you rather than penetrating deep into the tissue because there is plenty of water around in your skin cells. Our infrared panels have a power output level of only 0.1 W/cm^2. The sun, every day, outputs a level around 0.06 W/cm^2. In other words, the intensity of IR from our strongest panels is about the same as average power of the sun. There are, to date, no studies showing that Far infrared exposure has any sort of negative health impacts and certainly not at the dosages received from infrared heating panels. In fact, Far IR is considered by many to be quite healthy and can help gently increase blood circulation, rid the body of toxins and even provide pain relief. Ducoterra’s infrared heaters are simple, lightweight half-inch thick panels that range in size from 2′ x 2′ up to 2′x 6′. Part of our product innovation is our simplified and rapid assembly process for these panels. We use a high-performance Aerogel insulation, originally developed by NASA, that improves both efficiency and aesthetics of the product and have engineered the heating element to take maximum advantage of material performance characteristics. Our infrared heating panels contain an electrical resistance wire that warms as current is passed through it. SolaRay panels are warm, but not hot, to the touch when in operation. They are backed with reflective material and our high-performance insulation to direct the heat into the living space. Ducoterra’s SolaRay infrared radiant heating panels utilize state of the art engineering and materials to provide the maximum output for your dollar. As a result, our panels operate more efficiently than any other comparable electric infrared heater on the market today.